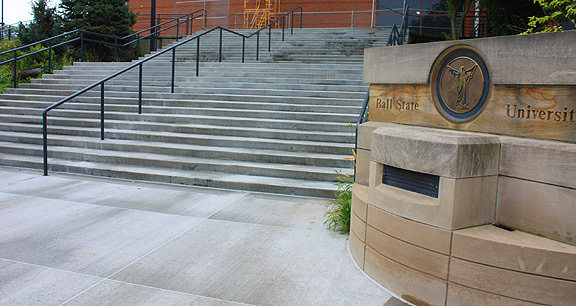 Project obstacles and solutions: Worthen Arena is home to Ball State University's basketball and volleyball teams. Built in 1991, the structure is undergoing a façade rebuilding project this summer. This has included replacing all of the six concrete stairways into the arena. R. L. Turner was chosen as the contractor for this project. In the 24 years since the arena was built, the original steps were showing a lot of damage from ice melting chemicals and corroding steel reinforcement. IMI supplied R. L. Turner with 500 yards of concrete for this project. IMI added a high-range water reducer to the mix. This does two things to the concrete. First, it increases strength by reducing the water-to-cement ratio. It also produces a creamier paste that not only makes finishing the concrete much easier, but also produces a better looking surface. In situations where the concrete is used as a finished product in a highly visible area, the look of the concrete is important. For more information on concrete aesthetics, contact the IMI sales representative nearest your location. Click here.